Today I attended a lecture by Duane Ross and his protege, Anne Roemer. Duane has been the head of the astronaut selection process for 37 years and I had a few minutes to speak with them after the lecture was over. Here is what I found out about becoming an astronaut. I won't discuss so much the published requirements, rather I'll be focusing more on the insider things. There have been 257 NASA astronauts over the years and an applicant has a 0.6% chance of being selected. Of those non-pilots selected out of civilian life 38.9% had completed a Masters degree and 38.3% had a PhD. Of the pilots selected 52% had a Master's and 43% had only a Bachelor's. 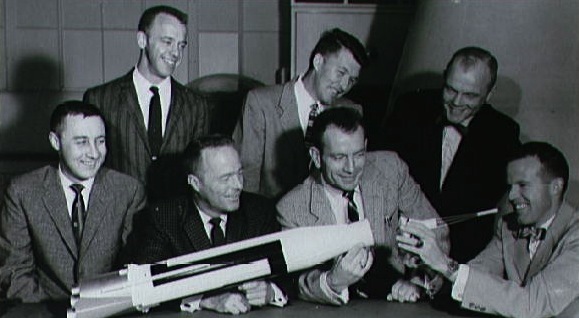 In total, nearly half of the astronauts selected had a Master's degree (45.2%). Basically its a myth that you need a PhD to stand a chance of being selected. If you have a non-technical bachelors degree that would otherwise disqualify you, a higher lever degree in a desired field outweighs that. Candidates are given an initial rating of "qualified" or "highly qualified" and sorted into similar groups based on background and skill set. This is to prevent apples to oranges comparisons with fighter pilots being compared to teachers. Candidates are rated and ranked within their grouping. Interviews and medical checks are begun for a period of 5 weeks - everyday, all day. More on this later. Once selected, candidates have several months to relocate to Houston. Becoming flight certified takes 2 further years of training at which point you qualify for 3 years mission specific training. The current group, which is half way though the interview and medical process, was told not to expect anything more than trips to the ISS (yet), and that that it would take about 8 years before their first flight. Why do you want to be an astronaut? Is it a passion or just because you think it would be fun? Can you fix things? Can you fix a car or a computer? How well do you cope with others and respond to change? Would this person be a good representative of NASA? Does this candidate have a personality that is too intense? Furthermore your qualifications must be met by the time the application process closes, rather than by the time your application is reviewed (They are all reviewed by people, there is no automatic system that looks for key words.). If you're anticipating getting a pilot's license, new degree, or a certain number of years work experience, it must be finished by the application due date. The interviews are conducted by a panel of astronauts who in turn make the recommendations of who should be selected. These recommendations are then approved by the JSC administrator and passed along to the NASA administrator for final approval. Here's where it gets spicy. While the basic requirements for consideration have been loosened, the medical requirements have not. It was implied that they are nearly as stringent as they were for Mercury, Gemini, and Apollo. This is because they are planning for long duration flights and need people in utmost physical condition. They are much more difficult to pass than they were for Shuttle. Things they examine include: physical measurements of just about everything, eye examinations, dental examinations, MRIs, stringent heart and cardiovascular checkups, and the VO2 max stress test. There is no age limit, and if you can pass you're good to go, but chances of passing do decrease with age. In the past they've selected people from ages 23 to 46. They also need to consider that they will get more use out of a younger astronaut. However certain things will disqualify you immediately. Kidney stones are an instant no-go, even if you've only had one once. Eyes however are a different story. If your vision is no worse than 20/400 and correctable to 20/20 you can be considered. If your vision is no worse than 20/800 and LASIK can put you into the "20/400 correctable to 20/20" category then you are also good go. (I don't want anyone running out and getting LASIK because of this without doing their own research FIRST. Your eyes are not my liability.). This assumes of course that there is nothing else wrong with them, and that you just simply need glasses because things are fuzzy to you. 2 years must have passed since the surgery to qualify. As a side note, be aware that the effect on a person's eyes due to long duration spaceflight are very serious and don't always recover when you get back home. There is much much much more to the medical side of things but Duane and Ann aren't involved in that. According to them its almost an entirely separate selection process. I have the contact information for the people who are involved on that side of things, but I'm not going to contact them until they are finished with the current group of Astronaut Candidates. This brings me to my next point - Astronaut Candidates are not guaranteed a selection. What surprised me the most was that during your time as an AsCan if you cannot learn Russian to an "intermediate-low" fluency, you're disqualified. From experience I can tell you that Russian is not an easy language, so get started on that now if you're serious. Lastly, the question was asked about how many applicants were internal to NASA. Surprisingly there were only a few hundred out of the 6200 total and 4500 qualified people who applied. Most of them came from the Mission Operations Directorate (mission control, where I work), Engineering, and the Space Life Sciences division. I hope this helps, and once the current selection process if finished, I might be able to relay specific questions you all have. They do not know when the next selection process will be, but they anticipate it won't be soon, so if there is anything you need to work on, get started on it now while you have the time. This was a very interesting and informative article! I'm curious to find out more about the medical requirements if you would be willing to share. Thanks for fueling my passion and desire to become an astronaut! 1. In the past, vision requirements were very restrictive and ruled out a lot of people from applying (including me until they relaxed the requirement before the 2008 selection), but not it just has to be correctable to 20/20, regardless how bad your eyesight may be naturally. They also now allow for applicants to have had laser corrective eye surgery provided it was at least a year prior to application with no adverse side effects. 2. Medically, you have to be able to pass a FAA Class III medical exam just like any student pilot. That is the first medical hurdle you must overcome as you go from the Highly Qualified to the Interview stage of selection. 3. You must also fill out a long pre-screening medical history form where you list any medications you take routinely, hospitalizations any time in your life, every physician visit in the past 3 years and a detailed account of your medical history. Note that you must be completely honest here. Even if you have fully recovered from a past ailment, report it. Some items in your history such as kidney stones may be disqualifiers. 4. If you are selected to interview at NASA, they subject you to an even more invasive questionnaire and set of physical examinations. This also includes anthropomorphic measurements to see if you would even fit in a space capsule. The second round of interviews includes more invasive procedures such as a colonoscopy. Hello, I'm 17 years old right now but im extremely interested in the orion program, i already have my pilots license and i'm in great health, if i do chose to pursue this, what skills should i develop that will make sure i'm highly qualified for the position when i send in an application in the future aside from learning russian. Thanks ! The article was very informative !! But I still have a doubt , how many astronauts are chosen finally ?? And do you have o be an extrovert and excellent in studies to become one ? To the poster from October 17, I encourage you to continue with your education in a field of engineering or science. Gain firsthand experience with internships and coops if at all possible. NASA has many opportunities for undergraduates that dry up once you get past that stage of your education. There tend to be more opportunities to get engaged in engineering compared with science, but you should pursue a field that excites you and allows you to excel. Remember, your chances of being chosen as an astronaut are not big, so you should be happy with whatever career you choose to build. Stay healthy and pursue hobbies and interests that keep you learning and active in areas of relevance to the astronaut program. Remember also that NASA is not the only pathway to becoming an astronaut. The commercial sector is growing fast, and in a few years there will be more opportunities there. Good luck! To the poster from December 11, NASA chose eight astronaut candidates for the 2013 class (http://www.astronautforhire.com/2013/06/nasa-selects-2013-astronaut-candidates.html). They are a great group of people. I had the privilege to meet them all a few months ago at a NOLS leadership expedition course. You asked if one has to be an extrovert. Certainly not, but you need to be able to get along with people in a team and have a good demeanor. Your other question was whether one needs excellent studies. Yes, with competition to high for so few astronaut slots, one must be highly accomplished academically as well as professionally to be competitive in an astronaut selection. I hope that helps! hello. i am an aspiring astronaut, i am interested in all the three sciences ... which one is the best ? also i get severe blackouts ... can i still become an astronaut ?? I'm not sure what "three sciences" you mean, but I advise you study whatever interests you. The chances of becoming an astronaut are so slim, that you can't plan your life around it. Be the best you can be at whatever field you choose while still keeping your astronaut aspirations in mind in the background. Also, I can't advise on the medical aspects for your personal situation. I can guess that NASA would "select out" someone with a pre-existing condition like that. They have that luxury with thousands of qualified applicants. It could be that such a condition can be managed and be okay, but I suspect you would have to fly commercially rather than as a government astronaut in that case. Still, you would have to pass whatever the medical requirements are to fly. Hey Brian, Is it possible for a mining engineer to be an astronaut. Sagar, I think one day mining geologists and mining engineers will be essential skills for space settlement on other worlds. That's how will be able to find and exploit the resources we will need to "live off the land." Meanwhile, while space travel is focused on orbit and suborbit, I don't think that type of skill is in much demand yet. Before we astronauts into space on such mining related missions, there are unmanned projects underway, such as the NASA Resource Prospector mission and the Planetary Resources mission. Hi Brian, would it be possible to become an astronaut at 36? Would it be worth trying at least? Even if the possibility of becoming an astronaut was almost inexistent, would it be worth studying either Mechanical or Aerospace Engineering, learning to fly jets, etc., regardless of the outcomes? Would the chosen university to study any of these degrees be a determinant factor for selection? Thank you, D.
Yes, it's possible to become an astronaut at 36. I'm 37 now and feel that the next selection round (whenever it happens) will be the sweet spot for me. NASA has selected astronauts ranging from 26-46, with 34 as the median age. You're right in the ballpark at 36. In fact, the average age of the 2013 astronaut class was indeed 36! So dust off you resume and do what inspires you. Keep at it. Some selectees like Clay Anderson have applied as many as 15 times before ultimately being chosen. Keep in mind that training takes another several years, and then it could take a few more years to be assigned a mission. For this reason, most astronauts who fly are in their 40s or 50s. There are advantages to age in terms of the accumulated wisdom and skills you bring to a mission, as well as less of a concern with radiation exposure as you age. Hey Brian, I've just read through all of these comments and a few other articles and I've found that both the formal and informal requirements seem to perfectly describe me. However, I have yet to specify my degree plan (right now I'm going for an associates of science to start out) and through everything I've read I have yet to find many specifics as to what NASA actually wants up in space. I know you say to go with what interests me most, but that's a pretty broad category so I was wondering if you could recommend a list of degree plans that NASA has favored the most over the recent years. Thank you in advance for the reply! I have an important question, and I don't exactly know any astronauts personally...but thank goodness I found you! If one was looking to become an astronaut, would they have to have some specific job? For example, would one have to be a mechanic, or a computer scientist, or have some other degree/occupation to qualify? Does the specific college one goes to affect the chance of them becoming an astronaut? If one went to, say, MIT, would they have a greater chance of selection than someone who went to a different school? And would it be a good idea to be thinking about this career path before graduating high school? And to me, a very important question: I understand that eye surgery can be done to aid in qualification, but you mentioned LASIK as a potential surgery. I'm looking to get an implantable contact lens surgery once I have the money and age, and I'm curious to know if that would affect chances. Your responses are greatly appreciated, and thank you so much in advance! Thank you for this article it is helpful! I was hoping to find out if taking a daily prescribed thyroid hormone would prevent someone from being selected for a mission or work at the ISS. I estimate the volume of hormone that my doctor says I would need for five years to be less than a gallon, and that is conservative. Is there room for this particular cargo on a shuttle? Will they contact your doctor about your medical record? You are a star! Thank you very much for getting back to me Brian. I wish that you get selected very soon!! Please let me know if you do and I will smile for you. I have started learning Russian... just in case and the next move will be studying a science degree, either mechanical, aerospace engineering or physics, these inspire me. Thanks for the inspiration Brian. *- Degrees in Psychology (except for Clinical Psychology, Physiological Psychology, or Experimental Psychology which are qualifying). *- Degrees in Social Sciences (Geography, Anthropology, Archaeology, etc.). *- Degrees in Aviation, Aviation Management, or similar fields. Hi Anonymous, thanks for your questions, which I'll address in turn below. Q: If one was looking to become an astronaut, would they have to have some specific job? For example, would one have to be a mechanic, or a computer scientist, or have some other degree/occupation to qualify? A: Yes, you have to have a job. The minimum requirement is to have at least a bachelor's degree and 3 years of relevant professional experience in order to quality. Q. Does the specific college one goes to affect the chance of them becoming an astronaut? If one went to, say, MIT, would they have a greater chance of selection than someone who went to a different school? Yes and no. What matters most is that you are successful. You'd be better off flourishing in a lesser ranked school than floundering in a highly ranked one. However, reputation of schools doesn't hurt, and it's a well known fact that astronauts have come preferentially from some schools like MIT, Purdue, and Colorado. Q. And would it be a good idea to be thinking about this career path before graduating high school? Yes. Every decision you make can contribute to your goal. Don't obsess about it, but keep it in mind when you make choices in life. Q. I understand that eye surgery can be done to aid in qualification, but you mentioned LASIK as a potential surgery. I'm looking to get an implantable contact lens surgery once I have the money and age, and I'm curious to know if that would affect chances. A. For that, I would suggest you contact the Astronaut Selection Office and ask them. I think laser surgery is approved (assuming enough time has passed since the procedure was done), but other types of surgery may not be. Hi Ceder, for medical questions like that, I would refer you to the NASA Astronaut Selection Office. My hunch is that it may be a disqualifying condition. They look for any excuse to disqualify applications on the basis of medical conditions. Again, I am not an authority on the matter so suggest you ask NASA. Good luck! Q. Will they contact your doctor about your medical record? A. If you make it to the Highly Qualified round of selection, you will be asked to get a FAA Class III medical exam and fill out an extensive medical history form. Your references will also be contacted at that time. I don't think they contact your physician at this stage, but I imagine it's a possibility if you make it to the later interview stages. Even then, NASA is more likely to lean on their own physicians at that point since they'll be performing various medical tests on you. Thanks, Diana. It's the journey that counts. I wish you well on yours! Hi Brian. Do you know if there is a Vo2max requirement for selection. I plan on submitting an application . I have 15 years of medical experience and am fluent in Russian but am at older end of age range! I don't think the field of study matters as much as your proficiency and aptitude in the field. Plus, they really want people who are good at more than one thing with a breadth of experiences that demonstrate good social compatibility, emotional stability, and teamwork skills. Hi, Anonymous. I don't know if there is a specific Vo2max requirement. Obviously, they want healthy and fit candidates, so the better your cardiovascular conditioning, the better. Good luck! I'm a native Russian speaker so I'm wondering how much of an advantage that may provide during the application process (since proficiency seems to be a problem during training). I think I'm a pretty strong candidate (for 27) but every little bit helps! Hi Ruslan, I don't know, but I'm sure being fluent in English and Russian could give you a leg up if you're competitive in other areas as well. Good luck! Brian - you are a kind and considerate man to take time out of your life to answer everyone. I am active in both Twitter and the blogging world, do the same as you, and know that sometimes it can be a chore. So from all of those who haven't thanked you, Thanks. My fourth, and final, NASA application was over 30 years ago, Duane hadn't been there all that long. But from personal experience I can tell you he was the consummate gentleman, even though I didn't make it. I would suspect that to be unchanged to those seeking to apply today. He taught me the phrase, "It's easy to go fishing when the pond is so deep" which I still use today. He said that my application group for mission specialist had 3500, 1000 of whom were dropped in the first screen lacking a degree in hard science. Some how they ranked the other 2500 and I was #140. They interviewed 121 and culled out 19. When I asked him the difference between 140 and 119 he said "none." How about between 140 and 1? "Almost none." I would only echo your thoughts on being overly prepared. The differences will be in the smallest of details. Good luck to all. John, thank you so much for your kind words and for sharing some of your experience during past selections. Duane Ross is indeed a wise and considerate man whom I had the good fortune of meeting. I have a degree in computer science, and I went on to complete a doctor of optometry degree. Do you know if working as an optometrist would qualify as relevant work experience? I wrote off my dream of becoming an astronaut as unrealistic because of the statistics of being selected and went a different direction with my career. I enjoy my work and my patients, but space is a constant tug on my heart strings. Chris, I'm not certain if a degree in optometry qualifies. You could call the Astronaut Selection Office and ask them or just apply anyway and see what happens. Vision is certainly a very relevant topic in spaceflight, especially given what we know how about the harmful effects that it has on our eyes. Good luck! Computer science is an acceptable major subject, per the latest official information. So far, one OD has gotten a flight as a payload specialist (PS); this individual also held a PhD in biochemistry. Considering that several DVMs have gotten flights as MSs and PSs alike, that the Navy's senior-ranking finalist (albeit not selected) for the 2009 class was a dentist (not to mention that many more DVM and DDS/DMD types have at least gotten interviewed), and that clinical/physiological/experimental psychology are all acceptable (other fields of psychology are not), it stands to reason that the OD degree would be qualifying. It never hurts to ask! I have an application in for the ASCAN program myself, by the way. BSc in biology and psychology, and a Master of Public Health, on top of having been a commercial pilot and aviation ground school instructor for a number of years. Working on a second master's degree in aerospace science to fill in a gap year before medical school. Hello Brian I'm currently in high school and I am hoping to be an astronaut when I'm older. I have great health except I have ADHD. Would this affect me going into the astronaut program? Are you able to give any more detail on the mental requirements? I just want to know if my adhd would disqualify me completely or if it's still a worthwile thing to pursue. Thanks! Thanks for posing more about the process. But how do the astronauts themselves find out if they've been selected? If they have a problem, such as a correctable medical problem or are not quite fluent in Russian, are the given time to correct it or are they disqualified immediately? Good luck to you, William! Thanks for sharing your insights! Abigail, I don't know for sure if ADHD is a disqualifying condition with NASA or other space agencies. My guess is that they have the luxury of having so many candidates with "spotless" mental and physical health histories that they probably do rule out questionable issues like that. However, I would encourage you not to give up and to manage your ADHD so that your performance is optimal. Use the hyper-focusing aspects of it to your advantage, and see how far it takes you! Hi Genelle, I'll answer you much like I did Abigail. I don't think asthma itself is a condition that is non-manageable in space. However, given NASA's huge applicant pool, they would likely tend to pass over people with any "marks" on their health records, even if those issues are easily managed and do not affect daily performance. Good luck! Anonymous, I think you're asking how NASA accommodates astronaut candidates who struggle with part of the ASCAN training program. I don't know, but to my knowledge, no one has ever flunked out of that program. There are anecdotes of ASCANs having trouble with parts of it (Russian, flying, etc. ), but I think NASA finds ways to give the people extra training so their investment in the training isn't in vain. Thank you for taking the time to give such useful information for the process. I am just beginning college and pursuing a degree in a field that I am extremely passionate about, aerospace engineering, and I was hopeing to pursue a career as an astronaut in the future. I have dreamed of being one since I was a young girl and I understand the opportunity is limited. Unfortunately, upon a visit to the doctor for a physical, it was discovered that I have scoliosis. I understand that this inhibits my chances of becoming an astronaut compared to the vast amounts of completely healthy applicants. Do I have any chances of obtaining this goal? Should I continue to pursue it? Thank you so much for your time. I saw someone post on Facebook that they were called and invited for an interview. If I haven't been called yet am I out of the running or do they call each group separately? I suspect for NASA that scoliosis would be a select-out feature. However, I encourage you to keep pursuing your dream. In the future, who knows what opportunities may emerge. Private spaceflight companies, for example, may not have such restrictions, depending on the g-forces of the vehicle. I too have seen the posts on Facebook about interviewees being contacted. In the past, they have done this by disciplinary group, so it may be in batches. Good luck! I would assume people who have artificial pacemakers cannot engage in activities involving shuttles and space, no? Which qualities NASA want in an astronaut? Thanks.